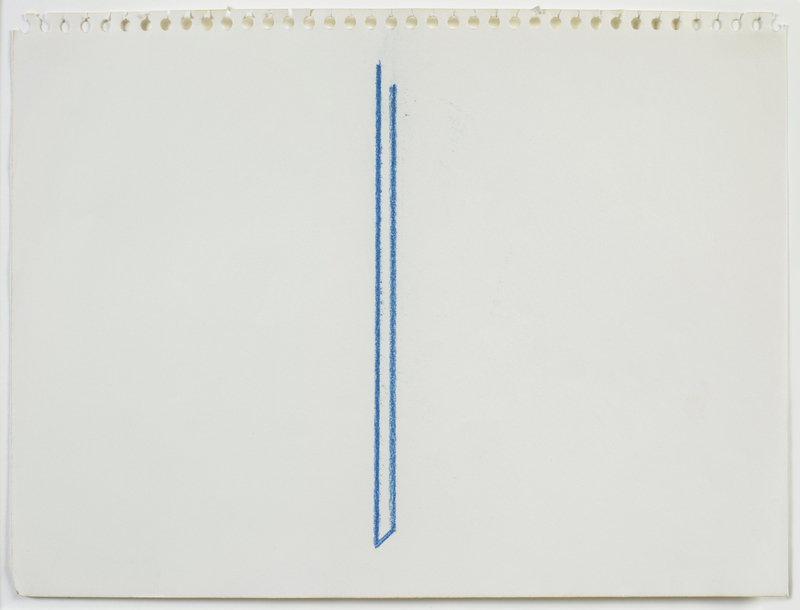 Drawn on deep blue Ingres paper, Fred Sandback’s untitled plan for an installation at the Marian Goodman Gallery (1985; fig. 1) evokes something akin to an architectural blueprint. Precise and spare, an axonometric pencil drawing of three walls of the gallery floats in the middle of the blue field. One wall, placed on a diagonal to denote recession into space, is rendered fully, while the two perpendicular walls are just barely suggested. Two narrow attached piers punctuate the main wall, dividing the space into three relatively equal sections. Six vertical white pencil lines, grouped in pairs but irregularly spaced, create another set of intervals. Although the graphite drawing clearly depicts an interior space in keeping with certain Western conventions, the demarcated walls are accorded no substance. Instead the dark lines pass through each other, disrupting a complete illusion. If, as the title suggests, we understand the space depicted to be the Marian Goodman Gallery, then the white lines represent Sandback’s proposed construction: lengths of white yarn stretched taut and run from floor to ceiling. Although he insisted that his works were “still sculpture,” Sandback also described them as “drawing[s] that [are] habitable.”4 Something of this overlap can be seen in the preparatory drawing for the Goodman Gallery installation. The two-dimensional drawing usefully suggests something of the phenomenological experience of Sandback’s three-dimensional work, its crisscrossing black lines creating a sense of volume without mass, a representation of an architectural space without an interior or exterior. A similar disorientation might occur when experiencing one of his sculptures. We understand the yarn outline as a volume in space, but then, with just a blink of the eye or a slight repositioning of one’s body, the line disappears, its fuzzy edges momentarily absorbed into the surrounding space. Indeed, Sandback’s drawings even suggest the material quality of the acrylic yarn that he used to create his sculptures. An untitled drawing from about 1975 (fig. 2), rendered casually in blue pastel on a sheet of notebook paper, consists of two long, vertical lines, less than half an inch apart and joined at the bottom by a diagonal line that gives the barest suggestion of linear perspective. Unlike the crisp pencil markings of Sandback’s more architectural drawing for the Goodman Gallery, these bright blue marks have a thick, sumptuous quality. Excess specks of pigment, generated by dragging the pastel stick down the sheet of paper, soften the edges, referencing the literal softness of the yarn that they represent. The lines operate less as contours of a shape and more as marks unto themselves. Similarly, in Sandback’s sculptures, the fraying yarn calls attention to itself as a fiber while still delineating an imagined volume in space. These works on paper operate as far more than mere flattened facsimiles of Sandback’s yarn sculptures. His drawing and sculptural practices informed each other, allowing for an exploration of the myriad possibilities of line as a formal element. Both on paper and in three dimensions, Sandback offered viewers a kind of impossible space that emerges—if only fleetingly—from a few spare lines. 1. 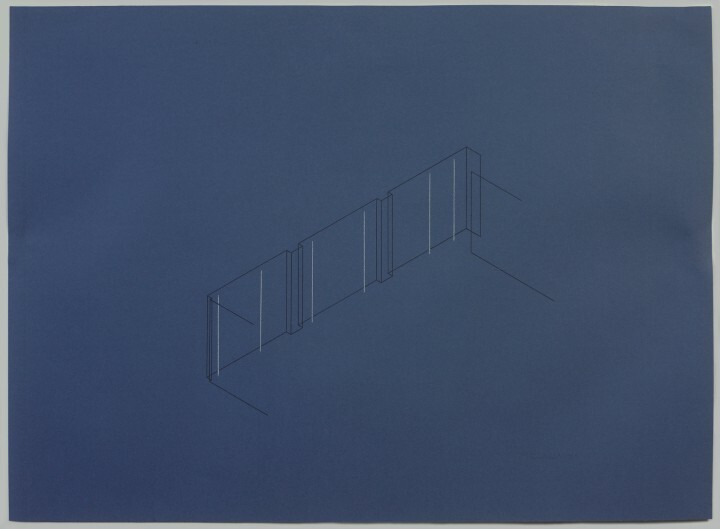 Fred Sandback, “Remarks on My Sculpture, 1966–86,” Fred Sandback Archive, http://fredsandbackarchive.org/atxt_1986remarks.html. 3. Fred Sandback, 1975 Notes, Fred Sandback Archive, http://fredsandbackarchive.org/atxt_1975.html. 4. Fred Sandback, 1998 Notes, Fred Sandback Archive, http://fredsandbackarchive.org/atxt_1999stat.html. Fred Sandback (b. 1943, Bronxville, New York; d. 2003, New York) received his BA from Yale University, New Haven in 1966 and his MFA from Yale School of Art and Architecture, New Haven in 1969. His most recent solo exhibitions have been held at Rhona Hoffman Gallery, Chicago (2009); Instituto Moreira Salles, Rio de Janeiro and Sao Paulo (2010); the Davis Museum and Cultural Center, Wellesley College, Wellesley, Massachusetts (2010); Whitechapel Gallery, London (2011); the Museum of Contemporary Art, Denver, Colorado (2011); and David Zwirner, New York (2012). His most recent group exhibitions have been held at The Menil Collection, Houston, Texas (2008); Hayward Gallery, London (2009); the Hirshhorn Museum and Sculpture Garden, Washington, DC (2010); the Art Institute of Chicago, Chicago (2010, 2011); The Museum of Modern Art, New York (2010); Museum moderner Kunst Stiftung Ludwig, Vienna (2011); and Lannan Foundation, Santa Fe (2012). His work is held in the public collections of The Museum of Modern Art, New York; the Metropolitan Museum of Art, New York; Yale University Art Gallery, New Haven, Connecticut; the Whitney Museum of American Art, New York; the Solomon R. Guggenheim Museum, New York; and the National Gallery of Art, Washington, DC. A detailed illustrated exhibition history and bibliography, together with the artist’s complete writings is available at www.fredsandbackarchive.org. Elissa Yukiko Weichbrodt was born and raised in Honolulu, Hawaii, and received her BA in Interdisciplinary Studies from Covenant College in Lookout Mountain, Georgia. Elissa is currently a PhD candidate in the Department of Art History and Archaeology at Washington University in St. Louis and is completing her dissertation on corporeality, subjectivity, and empathy in contemporary American art. She has previously worked with the Mildred Lane Kemper Art Museum as a curatorial assistant for the 2007 exhibition On the Margins and as co-curator for the 2009 exhibition A Challenge To Democracy: Ethnic Profiling of Japanese Americans During World War II. Fred Sandback, “Remarks on My Sculpture, 1966–86,” Fred Sandback Archive, http://fredsandbackarchive.org/atxt_1986remarks.html. Fred Sandback, 1975 Notes, Fred Sandback Archive, http://fredsandbackarchive.org/atxt_1975.html. Fred Sandback, 1998 Notes, Fred Sandback Archive, http://fredsandbackarchive.org/atxt_1999stat.html. Posted in Elissa Weichbrodt, Fred Sandback. RSS 2.0 feed.